The squash competition takes place at the sports accomodation ‘Bateas’ in Ghent. The accomodation has 5 courts. Click to see how to get to Bateas. 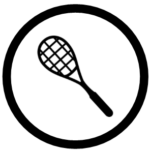 The squash competition is a team tournament. A mixed team contains 1 woman and 2 men ( 2 women and 4 men). The teams re ranked in each pool on points, so that the team with the most points is no. 1 and the next-best team no. 2 etc. If 2 teams are tied, the games they have player together decide the results. If the teams are still tied, the team with the biggest difference between games won and games lost, the difference between sets and then in points is the winner. The rules of the International Squash Federation apply (WSF).